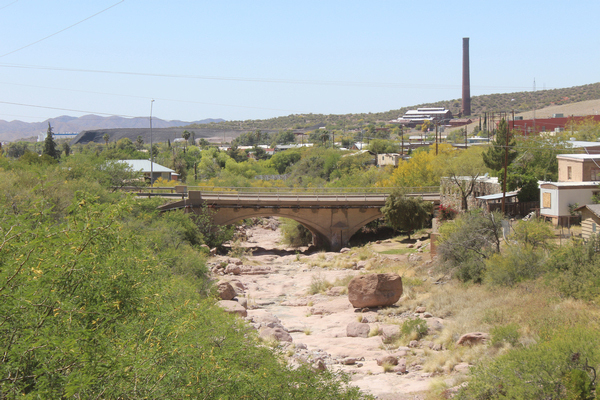 In April, I drove up to the town of Superior to check out a section of abandoned U.S. Highway 60 that I had read about in "Good Roads Everywhere, A History of Road Building in Arizona". The 2003 report noted that the Queen Creek section of the road was one of Arizona's most important highway projects of the 1920's. It was written that the "Integrity of design, materials, and workmanship has been retained in most portions of the road...." It is "an outstanding example of road engineering". The old Claypool Tunnel and the original bridge across Queen Creek are still in place. In the late 1940's and early 1950's the Queen Creek Canyon section of the highway was re-routed. 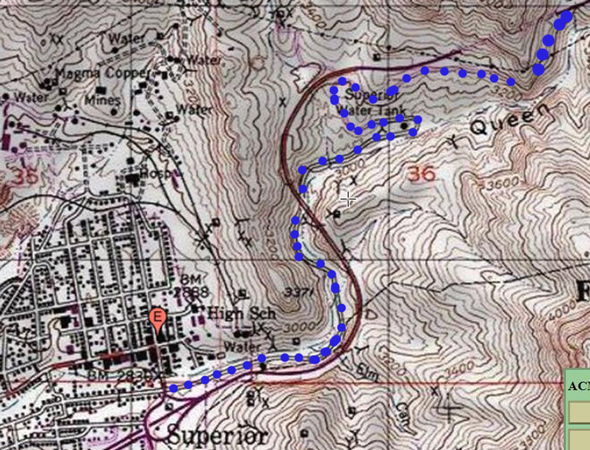 The map shows the original road highlighted in blue and the new replacement road in red. I started the adventure on the old road segment at the edge of town. Vehicular access to the old highway is restricted. A sign on a locked gate across the road indicates that the property beyond is private, but there are openings to the sides of the gate for pedestrian traffic. It was a pretty easy walk on the old roadway up to the Claypool Tunnel. The walk was a bit more than 4 miles round trip. At the beginning of the road segment, there are buildings along the creek on the west side. Several are of very interesting construction. The last one in the line was called the Magma Club. In the early days of Superior, it was a social center for the miners and their families. The building has been restored and once again is in use. The areas mining history is evident everywhere alongside the old highway. This ore bin is to the west of the road while the old brick and stone foundations are to the east. There are numerous mine openings, many of which have been effectively closed to human access yet still allow use by birds and bats. The geology of Queen Creek is very interesting. Sedimentary rock layers that are normally horizontal are steeply inclined here. The pavement has all but disappeared in the lowest section of the old road. It is much better preserved a bit further on. The retaining wall in the distance is the new Highway 60. Approximately, 1/2 mile up from town, two highway bridges come into view. The upper bridge is associated with the modern Highway 60 while the lower one is original to the older abandoned section. This concrete bridge was constructed in 1920-21. In a document, "Vehicular Bridges in Arizona". the bridge is classified as an "open spandrel concrete arch" bridge. The name comes from the open area between the roadway deck and the arch. This was apparently an experimental design tried by the Arizona Highway Department. It was an expensive and difficult design to implement. Only a few bridges around the state were built like this one. The bridge is on the National Register of Vehicular Bridges. Modern Jersey Barriers are being used to protect a pipeline that now runs across the old bridge. The town of Superior has several wells and a large metal storage tank up Queen Creek a short distance from here. The cliffs in the distance are known as "Apache Leap". That location was associated with the story of a group of Apaches who chose to leap to their deaths rather than surrender to the U.S. Army. 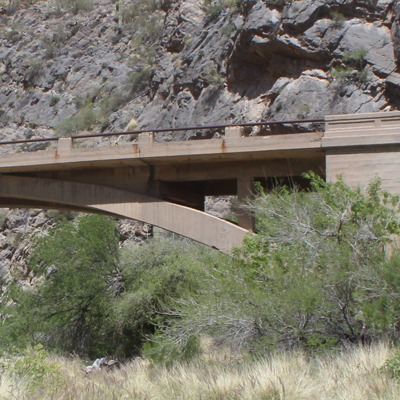 When Highway 60 was re-routed, this large steel arch bridge was constructed to carry the new road across the canyon. It was completed around 1949. A very similar bridge was built several miles further north to cross equally deep Pinto Creek Canyon. This concrete wall served as a guard rail and as a retaining wall. The rugged nature of Queen Creek Canyon can be seen in the distance. It was because of that terrain that there was no connection between Superior and Miami until this road was constructed. Compared to the condition of the old pavement down lower, this pavement seems to be in pretty good condition. In the "Good Roads Everywhere...." report referenced above, the pavement materials are described as "pebbly". The aggregate used in the road is certainly more coarse than that normally used in modern pavement. 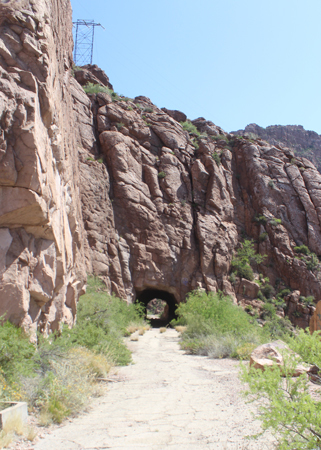 In a little more than a mile, the road started its climb away from the bottom of Queen Creek Canyon. Two switchbacks were used to gain the elevation necessary to reach a location where a tunnel could be blasted through a "skinny" ridgeline. The large talus slide in the center of the photo is material excavated in the construction of the Claypool Tunnel. The south portal can be seen at the top of the slide. 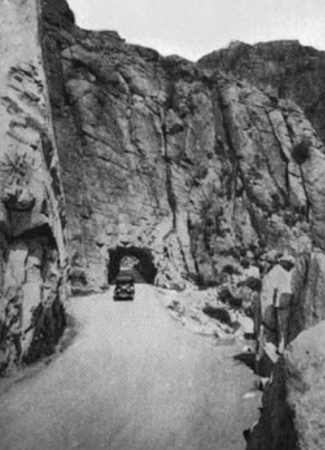 The Claypool Tunnel may have been one of the earliest highway tunnels constructed in the state. This view from above the switchbacks is to the west across the new highway. The mine operation may have been a part of the old Magma Mines. Along this stretch of road, there was not much shoulder room on either side. I wonder if there were guard rails. It is difficult to understand that this was a two lane road and was open to all kinds of traffic including large commercial vehicles. From this south side of the tunnel, the view of traffic would have been quite clear. That was not the case on the other side! It would not have been a good thing to have been in the wrong lane. The "guard rail" was quite low along here. The drop was precipitous! The Claypool Tunnel was not re-enforced. It pretty much was just a hole blasted through the rocks. I do not know what the purpose of this series of holes was. Each opening is 18" in diameter and goes into the wall for many feet. The rock pillars are north of the Claypool Tunnel and across Queen Creek Canyon. The old and new sections of Highway 60 merge together just around the corner ahead. The modern Queen Creek Tunnel opening is out of sight on the left. 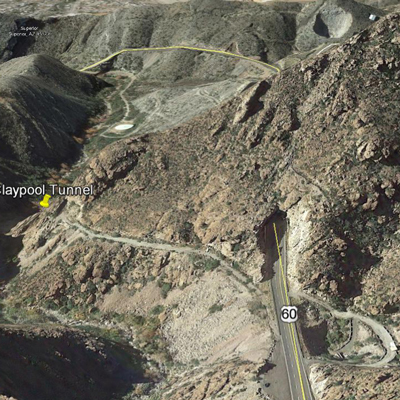 This Google Earth View is looking down onto the north end of the two tunnels. The new tunnel was completed in 1952. 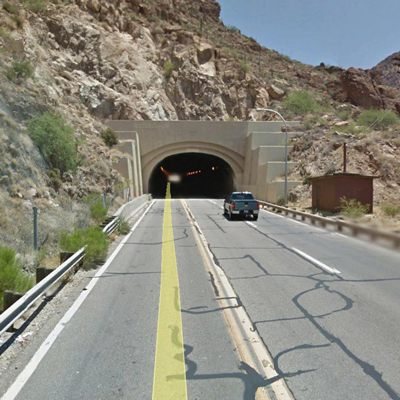 In this Google Earth Street View, the vehicle is entering the south portal of the Queen Creek Tunnel. This view from near the Claypool Tunnel is looking back toward Superior. Picketpost Mountain is on the skyline in the distance. The large tank is part of the Town of Superior's water system. Many of the trees in the bottom of the canyon are large Sycamores. There was no water flowing in the canyon in April. Except for the mobile home, this view of Queen Creek and Superior is probably pretty similar to what the view would have been to motorists as they arrived in town after having navigated the old section of Highway 60.